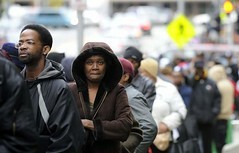 Unemployment Situation: A Longer Wait Time for People of Color? The Bureau of Labor Statistics released updated unemployment numbers for May 2010, and the story hasn’t yet changed…sort of. Nearly one in ten US workers continue to go without work, but the reality is still more unsettling for people of color. Unemployment for white workers has fluctuated a few tenths of a point in recent months, and now sits at 8.8 percent. Workers of color, on the other hand, are still weathering unemployment storms of double-digit magnitudes. Latino unemployment fell 0.1% from the previous month to 12.4 percent. And, Black unemployment, despite a one-point drop, is still highest of all at 15.5 percent. It's worth noting that last month's unemployment numbers are slightly distorted due to a rise in temporary government employment for Census 2010. That aside, we should continue bracing ourselves for a long and rough ride back to full employment. Challenges to come, absolutely. But the worst being behind us? That has yet to be seen. Despite the historic legislative strides made or in process as of late, the voices of well-funded special interests continue to overwhelm those of average Americans, let alone people of color. Latino and Black workers are, respectively, 1.40 and 1.76 times more likely to be out of work than their white counterparts, highlighting that not enough is being done to address the roots of racial economic inequality. So, when they say stability is still a few years away, what does that bode for communities of color? How long will they have to wait? Until the administration and Congress get serious about enacting economic policies that will truly serve those in need, and not pandering to the desires of moneyed interests, that “foundation for prosperity” won’t be possible – especially for people of color. We need targeted job creation aimed at employing workers in economic deserts – those communities most devastated by this crisis. We need measures in place that will safeguard consumers from the traps set by financial predators who place families’ economic well being in jeopardy. We need progressive tax policies that will generate revenue for social programs that make recovery and broadly shared prosperity possible. And, we need these types of policies to start now.